Your AT&T Office@Hand Desktop App by default is integrated with your phone contacts. You will be able to view your personal contacts through your Office@Hand Desktop App. Note: Your Office@Hand Desktop App will show your personal contacts from your Office@Hand Online Account, as well as your Google and Outlook contacts. To view or filter your Contacts from your Office@Hand Desktop App, click the Filter button. You will then, be able to view the Contacts section of your Office@Hand Desktop App. All includes your unfiltered contacts from your Office@Hand Desktop app and online account. 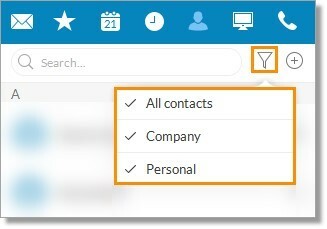 Using the search on this view allows you to search on your different contact lists and filters. Personal Contacts include your Outlook Contacts and Personal Contacts from your Office@Hand Online Account. Company Contacts include other Users and extensions in your Office@Hand Online Account.